The notion of a “platoon split” refers to the fact that, on average, batters have more success against opposite-handed pitchers than they do against same-handed pitchers. Thus, right-handed batters generally fare better against left-handed pitching, and left-handed batters generally fare better against right-handed pitching. If you think this sounds like some Monty Hall voodoo, take a look at the numbers. It’s one of the oldest tricks in baseball. Occasionally, however, a player will buck the trend and find himself with a reverse platoon split, meaning that he hits same-handed pitching better than opposite-handed pitching. 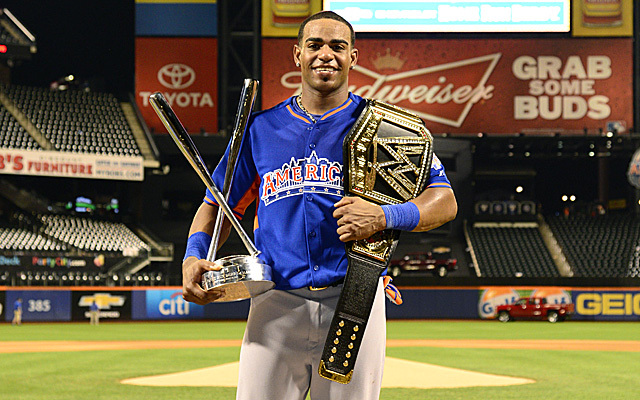 Such appears to be the case this year for Detroit outfielder Yoenis Cespedes. His 3.2 fWar is good for twenty-second overall, and his 120 wRC+ (a comprehensive measure of offensive value) is third-best on his team, behind only Miguel Cabrera and the sensational J.D. Martinez. Pretty good. These numbers aren’t even close. Any way you look at it (with the exception of a slightly higher walk rate– 7.1% versus 3.8%– against lefties), Yo is much better against same-handed pitching than he is against opposite-handed pitching. Cespedes’ overall career numbers, mitigated by a clear conventional split in 2013, show a slight reverse platoon split, but not to the degree he has exhibited so far in 2015. Yo, though, has flipped the script in three of his four MLB seasons, and the size of the split is expanding. In 2012, his first year, the spread between his wRC+ against right-handers and left-handers was merely eight. It ticked up to thirty-two last year, though, and, as seen above, it’s up to eighty-six through more than half of the 2015 season. For a right-handed hitter, a sustainable reverse platoon split should be considered a skill, or, at least for however long it persists, a valuable phenomenon, simply because there are far more right-handed pitchers in baseball. If a hitter is going to have a split, as virtually all do to some degree, better for it to favor situations in which he finds himself most often. Sorting out how Cespedes is achieving this result (or, more passively, why this is happening to him), and why 2015 looks like a breakout year for him in this respect, is more difficult. Generally speaking, he has seen the same mix of pitch types throughout his MLB career, and it’s tough to know in which direction to orient the causation arrow when looking at, for example, the spike in his whiff percentage against lefties this season. While this was the only apparently meaningful difference I could find in Cespedes’ hitting approach based on pitcher handedness, I am not confident that it explains his results. First, while the above graph shows Cespedes did cross the streams for the first time this season, intuitively, the size of the spread between the two data points seems unlikely to correspond to the magnitude of the more radical expansion in his reverse platoon split. Moreover, viewing his plate approach on a month-to-month basis shows that this relative relationship has existed at times during each of his MLB seasons, including the 2013 season, in which he displayed a clear, conventional platoon split. Second, it doesn’t seem to mesh with his walk rate, which is higher against the left-handed pitchers he is approaching more aggressively. Third, his passive approach to right-handed pitchers, the ones he’s hitting well, cuts against a current trend that finds hitters doing better with more aggressive approaches. Despite the extremity of Cespedes’ 2015 reverse platoon split and the trend-of-sorts that one can spot by squinting one eye and closing the other one that was looking at his 2013 season, the most likely explanation may yet prove to be that all this is little more than the random variation that, in some manner or another, exists in every hitter’s results. Wiser minds than mine have counseled, in writings linked above, that sample sizes larger than a season, or even a few seasons, are needed before we can determine with confidence whether we are observing a skill that is reflective of a player’s true talent level. Taken together, Cespedes’ career wRC+ numbers in a total of about 2200 plate appearances show a very slight reverse platoon split, a spread of seven, to be exact. Less than a wild and crazy reverse platoon split, the largest sample available simply reveals the mark of a good hitter, one who finds success regardless of his opponent. This entry was posted in ALDLAND and tagged banished to the pen, baseball prospectus, brooks baseball, detroit, fangraphs, mlb, sb nation, tigers, yoenis cespedes by AD. Bookmark the permalink.